Turmeric is pretty amazing. There are a ton of health benefits to it, which apparently the Indian culture has known for pretty much forever. It’s been used in ancient medicine for over 4,000 years, going back to when residues of turmeric were found in ancient pots in New Delhi, India! So, why consider taking turmeric whether in a supplement form like this one or just adding the spice in its powder form to your diet? ANTI-INFLAMMATORY: The active ingredient in turmeric is curcumin, a potent anti-inflammatory that helps maintain healthy inflammation responses. BOOSTS STRESS TOLERANCE: As an adaptogen, it helps counteract the adverse effects of everyday stress on the body. SUPPORTS WEIGHT LOSS: Curcumin can positively influence weight management in overweight people. PROMOTES RADIANT SKIN: By providing proper nourishment, it helps your body produce more radiant and healthy-looking skin. SUPPORTS HEALTHY METABOLISM: Aids in maintaining normal blood sugar levels. SOOTHES DIGESTION: Reduces symptoms of bloating and gas related to occasional indigestion. One reviewer of the Truvani turmeric supplement raved about their knee swelling and after taking turmeric for some time, she noticed her knee was not puffing nor swollen looking! Many others who have taken turmeric noted they felt so much better, too, free from joint pain, back injuries, and other muscle aches! 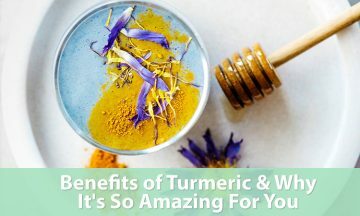 After hearing about the amazing benefits, how and why is turmeric so good? Another thing to note… Wellness Mama says to add some black pepper to amp up the absorption rate. Black pepper contains piperine, which has been shown to dramatically increase the absorption and effects of turmeric. That’s why you will see many of the supplements including black pepper in it’s ingredients as well. There’s always possible side effects when ingesting new herbs or spices and of course new supplements. Some people are allergic to turmeric and have an allergic reaction. Also, during pregnancy, turmeric is not recommended because it is associated with stimulating the uterus. Always check with your healthcare provider before taking turmeric! Enjoy finding all the new ways to enjoy this golden spice! We personally love the yummy golden milk recipe found on Mama Natural. Whether it’s oils, powders, gummies, or tablets… How do you take your turmeric? Editor’s Disclaimer: The content of this article is provided for general informational purposes only and is not intended as, nor should it be considered a substitute for, professional medical advice. Do not use this for diagnosing or treating any medical or health condition. If you have or suspect you have a medical problem, promptly contact your professional healthcare provider.